A joyful Lego recreation of Episode VII. What is it? A light-hearted retelling of The Force Awakens, in Lego. 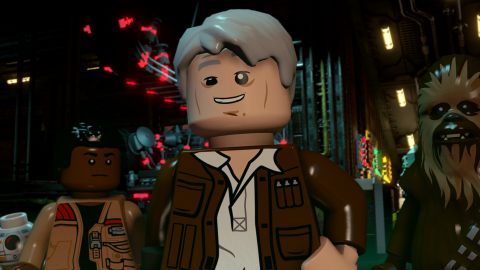 For a game based on a film that made $2 billion at the box office and one of the world’s biggest toy brands, Lego Star Wars: The Force Awakens feels surprisingly uncynical. It retells the story of Episode VII with charm, humour, and self-awareness, rendered lovingly in Lego bricks. And even though it’s a simplistic, easy game aimed at younger gamers, older Star Wars fans will still get something out of it. It opens with the Battle of Endor, which is a clever way of adding classic versions of Luke, Vader, Han, and the rest of the gang to the game’s vast stable of playable characters. You stomp around in an AT-ST, fight Stormtroopers as Wicket the Ewok, and fight alongside Vader as Luke to take down the Emperor. It’s a joyful, fast-paced half hour that makes the game’s intentions clear: we’re having fun with the Star Wars universe, we’re not particularly concerned with sticking to the script, and we’re going to make you laugh. Seriously, it’s really funny. On Endor you hear John Williams’ famous Ewok theme, then the camera spins around to reveal one of the furry critters playing it on a trumpet. When Luke removes Vader’s helmet, we see the winking face of Hayden Christensen’s Anakin Skywalker. He panics and pulls the plastic head off, replacing it with the more familiar version. And those are just two early examples of countless gags, the rest of which I’ll let you discover yourself. Once the Death Star 2.0 has been destroyed in an explosion of plastic bricks, the game shifts to the events of The Force Awakens. It follows the film closely, but with some deviations. The scene where Rey scavenges in the Star Destroyer wreck becomes an extended sequence of acrobatic platforming. And her descent into Maz’s basement involves some light Tomb Raider-style puzzling. Straying from the source material like this in a regular movie tie-in would be weird, but in this slapstick alternate Lego universe it works. In fact, the game’s casual attitude to Star Wars canon is one of its greatest strengths. You can revisit completed levels in freeplay mode, using any characters you’ve unlocked. So if you want to roll around Endor as BB-8 or help Poe escape the Finalizer as Darth Vader instead of Finn, you can. And you can hop between planets using a Mass Effect-style galaxy map. I love this, because it captures the creative spirit of Lego, combining different sets to create your own dream moments. No other Star Wars game would let you speed around Niima Outpost as Lando Calrissian in a tiny Slave I. Remarkably, most of the original cast have been roped in to record new dialogue. I don’t know how much they had to pay Harrison Ford to play a plastic Han Solo, but it must have been a fair amount. They do a good job for the most part, although Daisy Ridley is clearly more comfortable playing Rey on screen. I liked her in the film, but here she sounds vaguely uncomfortable. Still, the real thing’s always better than a soundalike, and John Williams’ rousing score is in there as well. It looks fantastic too, particularly the way it combines its blocky Lego models with realistic lighting and depth of field effects. You almost feel like you can reach into the screen and touch their shiny little plastic heads. From the sand dunes of Jakku to the snowy forests of Starkiller Base, they’ve captured the look and feel of the film’s locations brilliantly. Graphics options on PC are sadly limited, but I had no problems playing the game with a steady framerate, at max settings, on a GTX 970 at 1440p. A lot of tie-ins are lazy, half-arsed attempts to milk some extra money from a movie (hello, Star Trek), but it’s clear this one has been developed with passion—and a lot of money. However, even though I’ve been ladling great big heaps of praise on it for the last few paragraphs, I don’t think it’s a very good game. It’s basic and totally undemanding, with simple puzzles that won’t stump you for more than a few seconds and action sequences you could complete in your sleep. But that’s fine. This isn’t a game you play if you want complex, nuanced systems to master; you play it because you want to mess around in the Star Wars universe, laugh at daft jokes, and relive the events of The Force Awakens in Lego form. It’s a chance to visit locations from the film, then give Wookieepedia editors a headache by filling them with characters and vehicles that have no right being there. It’s just fun, and sometimes that’s all a game has to be.